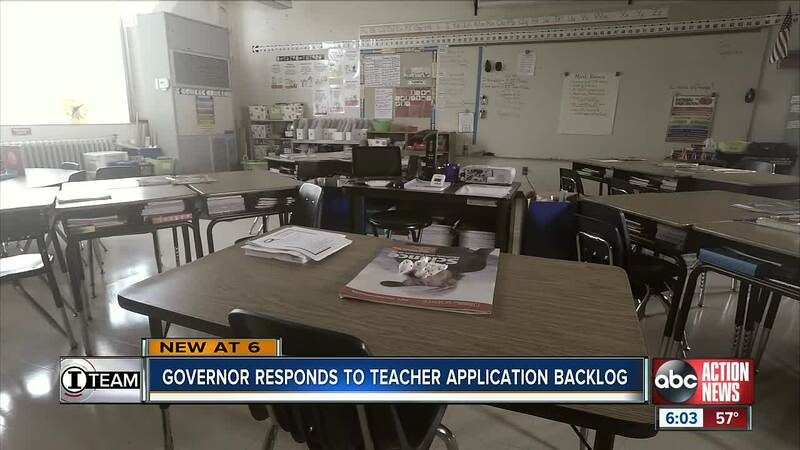 TAMPA, Fla. — Florida Governor Ron DeSantis didn't hold back when asked about a "severe" teacher application backlog plaguing Florida's Department of Education. "I've told him, 'hey, do what you need to do to whip the place into shape?'" DeSantis said during a stop Wednesday afternoon at Tampa Bay Technical High School to unveil a series of education reforms. His response comes more than one month after we started asking questions about application processing delays and one day after we first reported how the FL Department of Education (FLDOE) sent a statewide press release acknowledging the "severe backlog" and its plan to catch up. A spokesperson emailed the press release on late Tuesday afternoon at the same time the department finally responded to a public records request for data we submitted back in December. The data reveals how the delays have impacted Florida classrooms for years. Five years ago the state issued just over 91,000 certificates, according to the FLDOE. But during the 2017/2018 year, the department issued just over 31,000 certificates, a more than 65% drop. State numbers provided to us don't make it clear how many total applications were received during those years. In Florida, teachers must hold a permanent or temporary certificate to teach in a public classroom which is why Portia Sutton remains a substitute teacher. She has a Bachelor's degree and a Master's degree but still nothing to show for a teacher application she says she submitted to the state August 1. "It's very discouraging," she said. "I can't move forward with anything until I get my paperwork." According to FLDOE, wait times increased after the state implemented a new certification processing system but questions about that system and how it changed remained unanswered Wednesday. For school districts already struggling to recruit teachers, the backlog is painful. "We have about 300-350 vacancies in Hillsborough County right now," said District Superintendent Jeff Eakins. "This is the largest we've had for several years," he said. The Newly appointed Education Commissioner who also accompanied the Governor during his stop in Tampa on Wednesday told us he's added six staff members to help process certificates. He's also giving school districts priority to keep teachers they have but who are waiting on their certificates to stay. "So, if someone needs Katie LaGrone in the classroom, we're going to expedite them more quickly," he said. Corcoran said his plan will clear the backlog within 120 days. "From what they've shown me and everyone else, I don't think it's going to happen in that time but we'll see," said Portia Sutton, who's still waiting to for the state to process her application. "It's really been a nightmare. I just hope you [they] can get these applications processed. We're waiting."